Naomi Kinsman, YA author and Regional Advisor of my local SCBWI chapter, has an amazing day job. She runs this wonderful nonprofit called the Society of the Young Inklings, which encourages and nurtures kids in their creative writing. They also have a monthly newsletter called The Ink Splat that features a Q&A from a children’s author. For the Ink Splat during the month of April, Ink Splat editor Kalyn Josephson interviewed me about two of my great passions, music and poetry. I share the poem I revised the most from Summoning the Phoenix as well as my thoughts about the link between music and literature and some advice on revising. Read my interview “Making Music” at The Ink Splat! can speak, one can sing! Debtastic Reads Spotlights Summoning the Phoenix! I’m so delighted that Debbi Michiko Florence has chosen Summoning the Phoenix as her April Spotlight for DEBtastic Reads. In this interview, I share a little more about how my editor and I came to this hybrid poetry & prose format for Summoning the Phoenix. What I love about her Spotlight series is that Debbi gives away her review copy to a reader who really wants it. All you have to do is leave a comment at the Spotlight and Debbi will give Summoning the Phoenix to one lucky commenter! Read the April Spotlight for Summoning the Phoenix on DEBtastic Reads! Don’t forget to comment! Author emjiangPosted on Tuesday, April 15, 2014 Tuesday, April 15, 2014 Categories UncategorizedLeave a comment on Debtastic Reads Spotlights Summoning the Phoenix! Summoning Li Bai: My Guest Blog for National Poetry Month! My publisher’s wonderful marketing staff connected me with YA author, anthologist, and poet Emily Kristin Anderson, who invited me to participate in her National Poetry Month blog series. In my article, I start discussing how I translated the first poem I had ever memorized as a child (夜思 or “Night Thoughts” by Li Bai, one of China’s most famous poets who lived during the Tang Dynasty). Then I transition into how my early love of Chinese poetry influenced me while writing poems for Summoning the Phoenix. Read Summoning Li Bai & see more of April Chu’s wonderful art! Thank you, Emily, for including me in your celebration of National Poetry Month! Author emjiangPosted on Sunday, April 13, 2014 Monday, April 14, 2014 Categories UncategorizedLeave a comment on Summoning Li Bai: My Guest Blog for National Poetry Month! I have to prepare for my first book party tomorrow (SUNDAY) at Borderlands Books 2-4 PM in San Francisco’s Mission District. But I need to continue National Poetry Writing Month, so I’m offering yet another Twitter Poem, adding line breaks. This is my response to a Tweet from Sofia Samatar when she asked in general what is now the title to this poem. Author emjiangPosted on Saturday, April 12, 2014 Categories UncategorizedLeave a comment on Who Are Your People? Happy Blog Birthday to This Little Ditty, this week’s host for Poetry Friday! Today I want to address formatting a poem. When I write prose, fiction or nonfiction, I usually don’t care about what my words look like on the page. But when I write a poem, I really, really care about how it looks on the page. 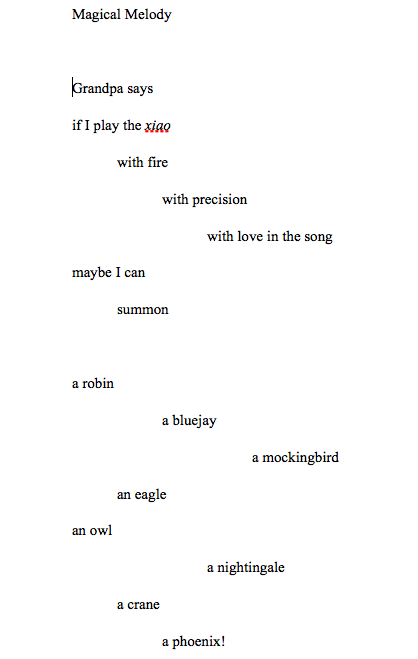 Shapes of stanzas matter. Left justification of a word vs. centering vs. right justification — each time formatting decision is a conscious choice. Punctuation matters; a comma has a different meaning from a semi-colon or a hyphen or an em-dash. Line breaks matter. Where I choose to break a line will change the context and content of the entire poem, even if I don’t change the words. Earlier this week Mary Robinette Kowal featured my guest post about my picture book Summoning the Phoenix on My Favorite Bit, and in my article, I describe how my poem “Magical Melody” changed format to fit the gorgeous and stunning artwork by April Chu. I had worked several revisions for this poem (adding and taking away punctuation, adding and modifying descriptive clauses, different stanza groupings) before paring it down to this list and this shape. Again, April’s artwork is stunning, and I analyze her art in detail on My Favorite Bit. In the end, there wasn’t enough space in her art to preserve the original format of my poem. In this case, the art was so worth the effort of changing the format of my poem. I’m delighted to share that Summoning the Phoenix is now available for purchase online! Thankful Thursday – Mark Reads Summoning the Phoenix! Last year at Worldcon in San Antonio, one morning I helped a blind man find an interesting-to-him session. Then I helped Nancy Kress find the Green Room. Because I was trying helpful to people I had just met, I was late for a reading, but the reading was good. After the reading I ran into Sunil Patel, who introduced me to some of his friends, including Mark Oshiro. Mark and I instantly bonded over our love for all things Tamora Pierce. So my morning of helping others ended happily in finding new friends! Mark also known as Mark Does Stuff. He makes these wonderfully entertaining videos of him reading books for Mark Reads and videos of him reviewing television series for Mark Watches. Mark is hilariously witty, a great reader, and I love watching his videos. Usually he reads novels, so I’m absolutely delighted that today he’s reading my picture book Summoning the Phoenix as part of Mark Reads! FYI, Mark is available for commissions for Mark Reads and Mark Watches. Consider commissioning a video! At $20 for 30 minutes, it’s worth every penny. Author emjiangPosted on Thursday, April 10, 2014 Friday, April 11, 2014 Categories UncategorizedLeave a comment on Thankful Thursday – Mark Reads Summoning the Phoenix! 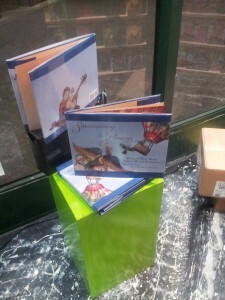 Great Display at Kepler’s for Summoning the Phoenix! My books are arriving at my local bookstores! When the awesome Angela informed me that my book Summoning the Phoenix had arrived at Kepler’s, I rushed to the bookstore as soon as I could. 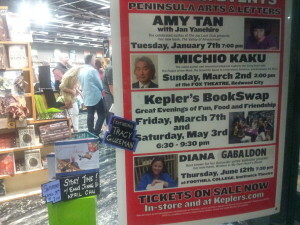 I arrived at Kepler’s last night at the end of another event for Starting Up Silicon Valley: How ROLM Became a Cultural Icon and Fortune 500 Company by Katherine Maxfield, author and wife of ROLM co-founder Bob Maxfield. What I did not know was that Bob and his co-founder friends all attended Rice University! I’m always excited to meet other Rice alumni. So of course, I had to buy the book. Katherine was so kind and wished me luck as she signed it. 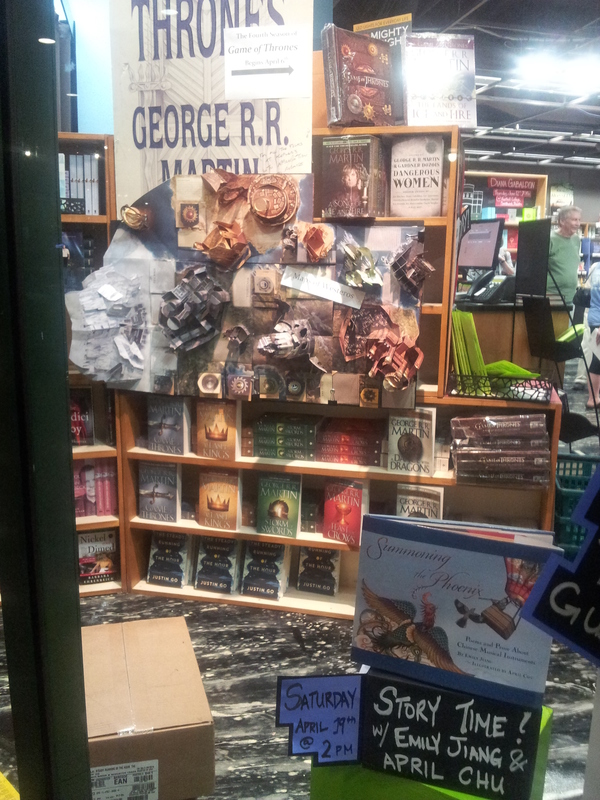 I’m beyond delighted that Summoning the Phoenix got its own window display! 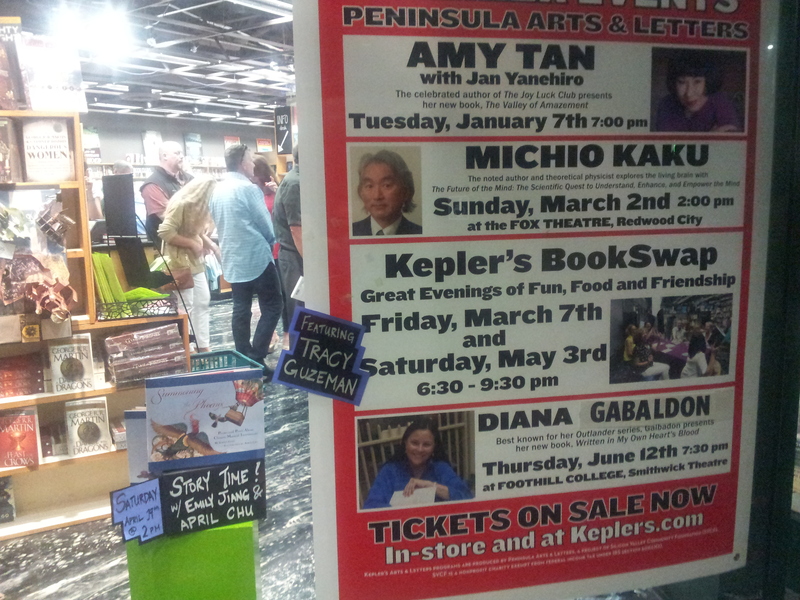 And it’s right next to a picture of Amy Tan! Or more accurately…a picture of Diana Gabaldon! majorly shaped me as a young adult reader. is surrounded by so many of my literary influences! That lime green box in the window is pretty spiffy. for kids’ line-of-sight as they walk in and walk out the store. Hope people can make it to my book parties!! 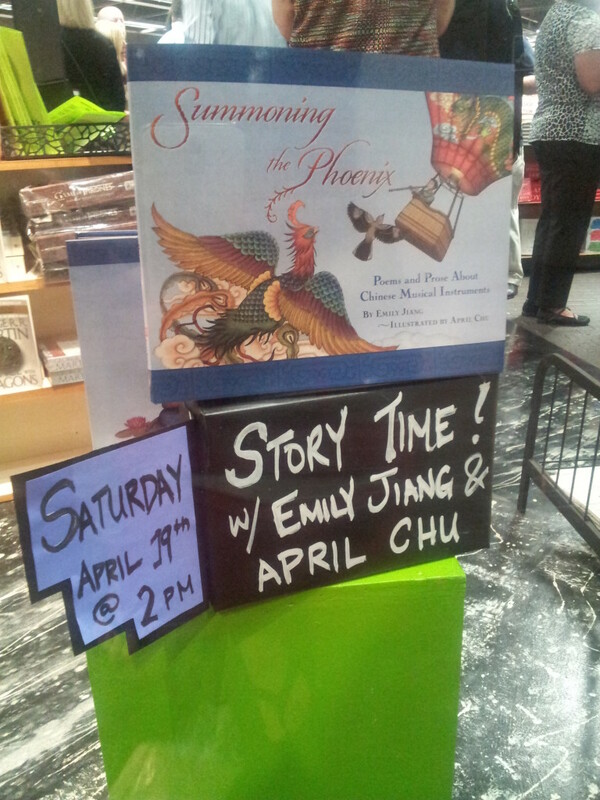 Author emjiangPosted on Wednesday, April 9, 2014 Monday, May 5, 2014 Categories UncategorizedLeave a comment on Great Display at Kepler’s for Summoning the Phoenix! Summoning the Phoenix Featured on Mary Robinette Kowal’s My Favorite Bit! Today I’m so thankful to Mary Robinette Kowal for featuring my picture book Summoning the Phoenix on her blog series My Favorite Bit! In this article, I talk about my poem “Magical Melody” (which inspired the book’s title) and how its format was changed because of the amazingly brilliant companion art by April Chu. I promised April that I would write something profound. Well, I’ll let you be the judge. 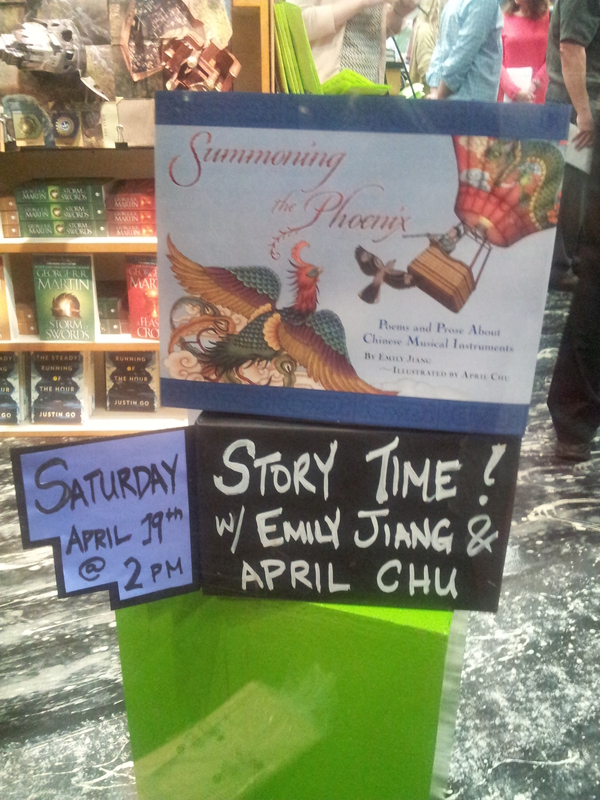 Read My Favorite Bit about My Book Summoning the Phoenix! Author emjiangPosted on Tuesday, April 8, 2014 Tuesday, April 8, 2014 Categories UncategorizedLeave a comment on Summoning the Phoenix Featured on Mary Robinette Kowal’s My Favorite Bit! Since I’m blogging everyday for National Poetry Writing Month in April, I’m rebooting Multicultural Monday and Thankful Thursday. 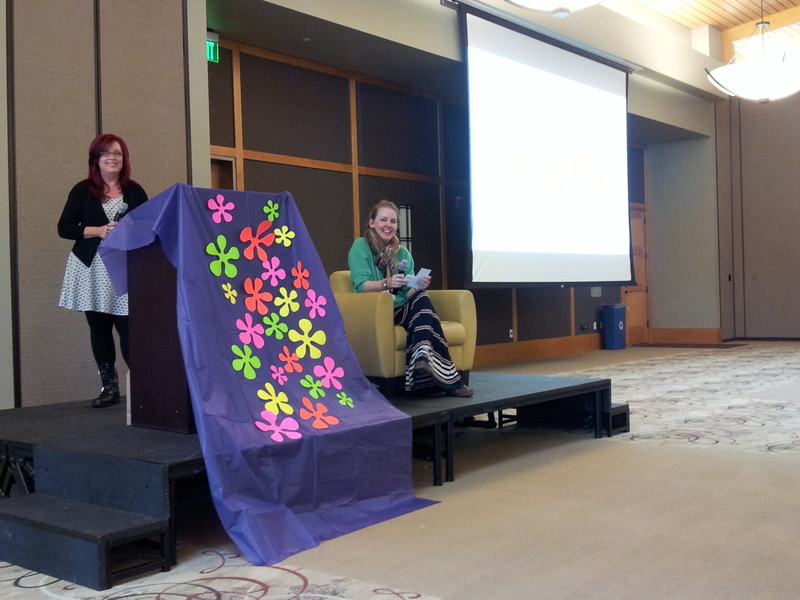 Today is a follow up post to my first post about SCBWI Spring Spirit 2014. I had a wonderful impromptu discussion with Nathalie Mvondo, Kim Zarins, and Amanda Concoran about how we can incorporate more diversity in children’s literature. I love reconnecting with such kindred spirits. If you ever have a chance to hear Nikki Grimes speak, GO FOR IT! And write the stories only you can write! 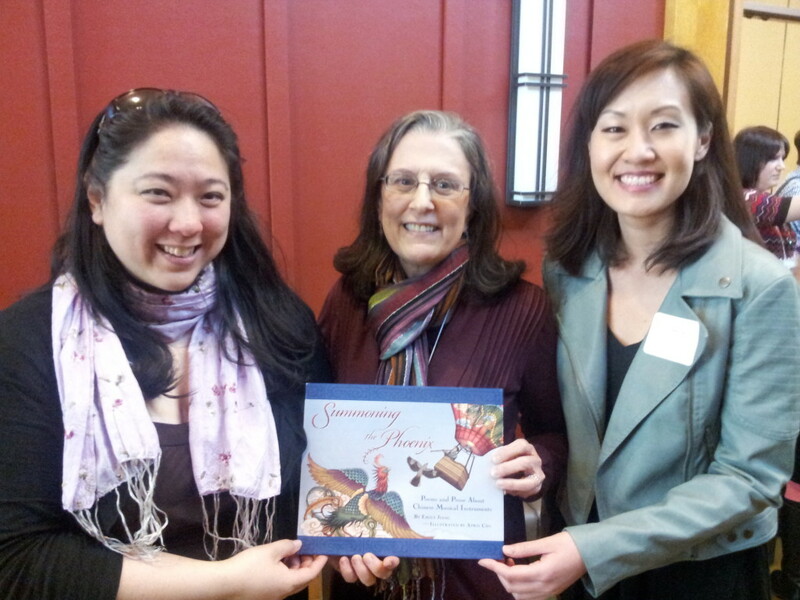 Yes, that’s me, Louise May, and April Chu all proudly holding Summoning the Phoenix, the book that we have brought into this world. A rare photo op! It’s funny when you meet someone in person for the first time after working virtually with them. I’m always a little surprised when my mental image (sometimes I don’t even realize I have one) of someone collides with the reality. When first I met April, I was surprised at how tall she is. When I met Louise, I was surprised at how petite she is. And I love her East Coast accent. Thankfully, she’s a hugger, like me. So exciting! For the the conference scavenger hunt, the first item on the list was the autograph of a published author. So I signed Item 1 for April Chu, Cynthia Mun, and Jenny Pessereau. It’s still a bit of an outer-body “Is this really happening?” experience for me to give my author signature. What a creative way to get to know people! My day started listening to Nikki Grimes sharing her philosophy on storytelling & reading her powerful poetry. Can I just say that starting your day listening to fabulous poetry is one of the best things ever? I’m devoting an entire blog post to this session tomorrow. Jay Asher is a New York Times Best Selling Author with his first book Thirteen Reasons Why. Many consider him an overnight success, but he disproves that misconception with his excellent talk, so wonderfully illustrated with slides depicting pop culture icons of the 1980s. Pretty awesome. She took a breath, and during that breath the wolf noticed the luscious curves revealed underneath her red cloak. She was not so little after all. Deirdre Jones & Tricia Lawrence discussed the differences between trade and school & library markets. Basically the publishers own copyright for school & library writing while the authors own copyright for trade books. Another unexpectedly joyous lunch-time experience occurred when I bumped into Nathalie Mvondo, Kim Zarins, and Amanda Conran and we had a wonderful discussion how to improve diversity in children’s literature. 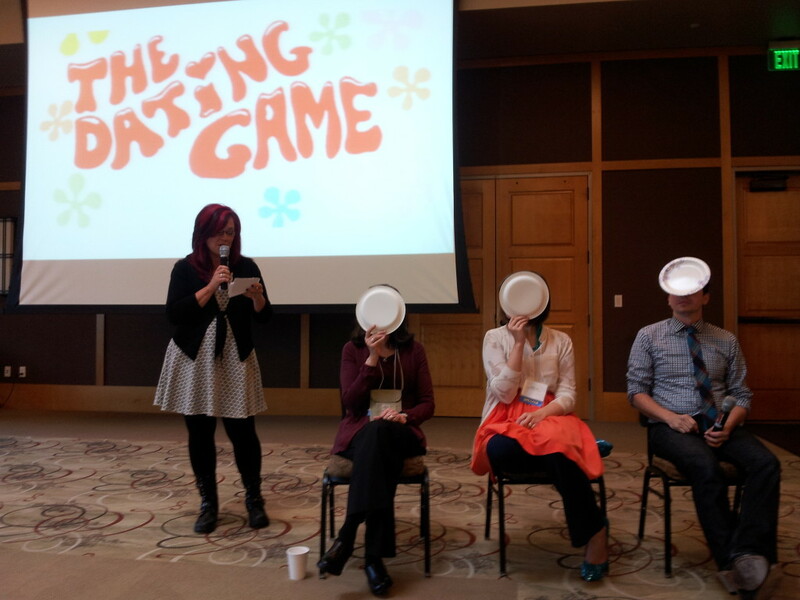 Cheri Williams was an emcee for The Dating Game, where agent Tricia Lawrence interviewed three editors Louise, Deirdre, Chad. I took these photos mostly because of the fabulous decorations. Louise May shared great examples from several picture books and emphasized the importance of language. Deirdre Jones outlined the structure and plot of one of her first and favorite books that she edited: What We Found in the Sofa and How It Changed the World by Henry Clark. Spring Spirit was such an information-dense day, and because it was sold-out there were so many people to meet and reconnect, like Mike and my own Region’s leaders Naomi Kinsman & Lea Lyon, as well as the amazing Kathy Shepler. 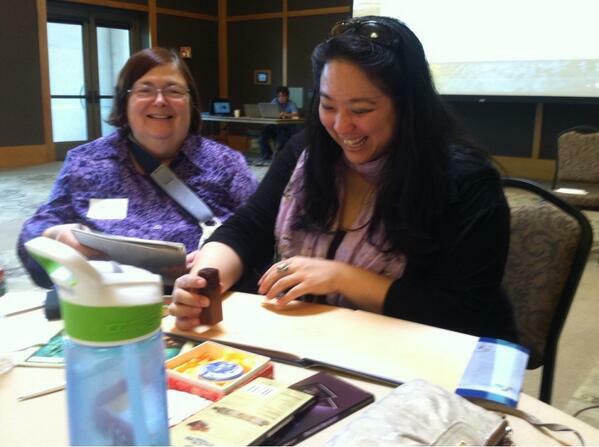 It was nice also to meet new-to-me attendees like Mira Reisberg and Stacy Heather Lee. The only down-side to such a packed day was that I didn’t have the opportunity to truly catch up with everyone, and I wish I could have spent more time conversing with authors like Erin Dealey, Bitsy Kemper, Deborah Davis, Annemarie O’Brien, Cassandra Whetstone, Linda Boyden, Tekla White, and many, many more. Some of them I hadn’t really spoken to in years, and I was sad to have missed them. Well, it’s a good excuse to return to Spring Spirit next year. Thank you, Patricia Newman, Catherine Meyer, Cheri Williams. You did an outstanding job in creating a welcoming, inspiring, fun-filled day!